Tribest Sedona Digital Food Dehydrators are some of the most well-designed and superbly constructed dehydrators in the market today. The design of these dehydrators is modern and advanced enough to look at place in any modern kitchen and the design conventions follow the needs and requirements of the users. By providing quality features, highly functional features, and ease of use, Tribest Sedona dehydrators have become a customer favorite in recent years. The unique features of the Tribest Sedona Digital Food Dehydrators add another level of ease and efficiency to dehydrating all kinds of foods. The features like double fans, night mode, fast mode, and debris collection trays make these dehydrators a must have for any serious dehydrating enthusiasts. What's more, the Tribest Sedona Digital Food Dehydrators have extensive capacity and you can choose from 9 or 11 trays for dehydrating fruits, vegetables, meats, and much more. The unique facility of power and performance in these dehydrators ensure you will use these for years to come. If you're looking for a Tribest Sedona Digital Food Dehydrator, it can be a difficult decision to choose one from the range available. That's why we have chosen the best dehydrators from Tribest Sedona in this write-up and you can now have a look at their specifications and features in an easy to read format. Whether you're a beginner with dehydrating or you've been dehydrating for years, you can really benefit from these dehydrators. Let’s have a quick look at the technical specifications and other features of these dehydrators. For any brand, there are certain common factors across their product line that define their quality. There are certain common features that you can expect when you buy a Tribest Sedona dehydrator. Here are some of the common features of Tribest Sedona Digital Food Dehydrators. When you buy a Tribest Sedona dehydrator, you can rest assured that you will use it for years to come. These dehydrators have a solid construction with a lasting design that will look contemporary even years from now. The material used to make these dehydrators is rugged and these are perfect whether you want to use them for hobby dehydrating or for extensive dehydration projects. The designs of Tribest Sedona Dehydrators can be called almost futuristic. With clearly displayed controls on the front panel, the dehydrators are easy to control and program. The glass door displays a clear view of the trays and when you open the door a light inside makes it easy to see if the food on the trays has dehydrated properly or not. Tribest Sedona Dehydrators bring a range of modern features that are simply not available in similar dehydrators from other brands. Features like Night Mode, Fast Mode, Two Stage Temperature, Dual Fans, programmable fans, and more make these dehydrators stand out from the models available in the market. Whether you want to dry meats, fruits, vegetables, or nuts, you can rely on these dehydrators to do a stellar job. The high temperature range and the two step temperature function makes dehydration more efficient and easier. Tribest Sedona Dehydrators are designed to save power and be highly efficient. The design of the dehydrators helps to minimize energy loss and the power saving features ensure your electricity bill will not be a surprise. The drying efficiency of the dehydrators means that you will be able to dry food quickly and more efficiently. It's not an easy task to single out the best Tribest Sedona dehydrators and we took great care in choosing the models that stood out from other models in this range. Here are some of the factors that we kept in mind while choosing these dehydrators. Customer Ratings – Customer ratings are essential in understanding what works and what doesn't work with these dehydrators in real world situations. We checked out the ratings that customers gave to these dehydrators on various review sites and chose the dehydrators that received the best ratings. Customer Reviews – Customer reviews are a great indication of how the dehydrators perform when used in kitchens. We read through customer reviews and ranked the dehydrators that got positive reviews from the customers. Essential Features – Other than the core features of the Tribest Sedona dehydrators, we looked at the important features that differentiated these dehydrators from the rest. By keeping these features in mind, we ranked the dehydrators accordingly. The Tribest Sedona SD-P9000 is one of the most popular dehydrators in this range. The device has a solid design that is built to last and the range of features sets it apart from other dehydrators for sure. The dehydrator comes with bright lit LED panels that make it easy to judge time and temperature remaining for the dehydration session. The glass door aids visibility of the dehydration process without the need to open the door. With BPA free trays and Dual Fan technology, using this dehydrator is a sheer joy when you want to dehydrate a lot of food. Let’s have a look at the technical specifications and other features of this unit. Dividing tray for smaller batches. Tribest Sedona dehydrators offer a range of features along with superb build quality and great drying efficiency. The SD-P9000 is uses 600 watts of power to dry all kinds of foods from fruits and vegetables to meats, herbs, nuts and much more. The quiet operation of this dehydrator is a blessing and it won't disturb the peace and calm in your house. For nighttime operation, you can choose the Night Mode that reduces the noise even further helping you to sleep in peace. With a five year warranty, you can rest assured you will get repair or replacement services for this device. If you’re looking for a powerful, efficient and uniquely features dehydrator, then you should pick this unit today. The Tribest Sedona Express SDE-S6780-B Food Dehydrator comes with all digital controls that make it easy to use and program. With 470 watts of power, you will never feel the lack of dehydrating efficiency and this dehydrator can dry all kinds of foods very easily. The device has 11 stainless steel trays that offer ample capacity for drying all kinds of foods. The durable construction of this dehydrator ensures it will last for years to come. Other features of this dehydrator like BPA free plastic body and glass door for monitoring the food make it a steal. With a ten year warranty, this dehydrator is a unique unit that will look good in any modern kitchen. Let’s have a quick look at the specifications of this unit. 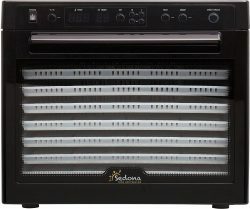 The Sedona Express SDE-S6780-B Digital Food Dehydrator is a highly efficient unit that brings 470 watts of drying power. The dehydrator is easy to use and program. The timer and temperature buttons on the front of the dehydrator add to the ease of setting up the dehydration process. You can view the dehydration progress through the glass door of the dehydrator and check if the food has dried up properly. The dehydrator is packed with unique features that will make dehydrating easy and fun for you. You can use this dehydrator for years to come without facing any issues. If you're looking for a dehydrator that offers quality and power, this is the unit for you! 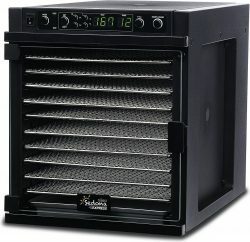 The Tribest Sedona Combo SD-P9150-B Food Dehydrator offers a unique set of features that make it easy to use and add to its drying efficiency. The dehydrator has an excellent feature called TST or 2 Stage Sequential Temperature Timer. When dehydrating food, this feature raises the temperature for the first few hours of dehydrating and then dehydrates at a regular temperature. This helps in bringing out the inner moisture of the foods so that everything can dry out properly. Other features include easy to program time and temperature panel, dual fan, and glass door for viewing the progress of dehydration. Let’s have a quick look at the specifications of this unit. The Tribest Sedona Combo SD-P9150-B Food Dehydrator has several powerful features. Its durable construction, modern set of features, and ease of use make it one of the most advanced dehydrators in the market today. The best part is that it is very easy to setup and use. You can program the time and temperature from the front panel and choose which mode you want to dry the food in. There is a choice of Fast mode, night mode, or raw mode. The flexibility of usage offered by this dehydrator ensures you will get the food dried easily and efficiently every time. If you're looking for a durable, powerful and feature packed dehydrator, pick this unit today. From Tribest Sedona, comes another stellar dehydrator that brings power and performance for hobby dehydrators as well as serious dehydrators. 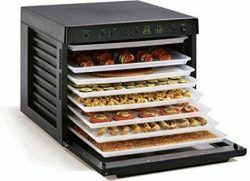 You can use the 9 trays in this dehydrator for drying all kinds of fruits, vegetables, meats and much more. The dehydrator offers excellent usage with its unique features such as digital timer and display panel that is easy to read. The dehydrator is also very easy to operate. There are no complex controls and you can start drying from the moment you open up the package and insert the trays. This is one dehydrator that will surely last you for years to come. Let's take a quick look at the specifications and pros and cons of this unit. Keep in mind, this dehydrator is made to operate at 220V and it's not suitable for use in the US. 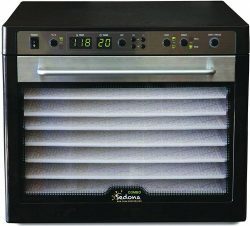 If you're based outside the US and need a dehydrator that comes with a complete set of features for all your drying needs, then look into this unique dehydrator. It is so very easy to use that you just have to add food to trays, choose the time and temperature and let the unit do the job. It dries quickly, efficiently, and also comes with a tray for catching debris from the food you've dried. The two stage temperature feature also helps in better drying of all kinds of foods. This is one dehydrator that will exceed your expectations from dehydration. The Tribest Sedona Express SDE-P6280-F is a digital food dehydrator with all the latest features you can ask for in a dehydrator. It has a digital control panel for adjusting temperature and time for each drying session. You can set it up and let it dry the food and the device will alert you once the dehydrating session is complete. With an extensive temperature range, you can dry all kinds of foods in this dehydrator with great efficiency. Please keep in mind that this item is not for sale in the US as it operates on 220v of electricity. Let's take a quick look at the technical specifications of this unit. For those living outside the US, a dehydrator like Tribest Express SDE-P6280-F can be a blessing. This dehydrator offers a powerful and easy way to dehydrate large amounts of food without wasting anything. The dehydrator is easy to use and it comes with an easy to view panel for setting up temperature and time needed for dehydrating foods. You can dehydrate everything from meats to nuts, fruits, and vegetables in this device. With 11 trays for dehydration, you will never feel the lack of space for drying foods. If you've been looking for a dehydrator with advanced features, pick this unit today. Customers often have questions regarding the dehydrators they want to buy and here are some frequently asked questions about Tribest Sedona dehydrators. Q: Are the trays of Tribest Sedona Dehydrators made from BPA free materials? Extreme attention is given to selecting the material used for construction of dehydrators as well as the trays. You can buy Tribest Sedona dehydrators with steel and plastic trays. The plastic trays are BPA free and if the body of the dehydrator is made of plastic, you can be sure that it's BPA free plastic and completely safe for use with all kinds of foods. Q: I am confused if I should get a dehydrator with steel trays or plastic trays? The answer to this question depends on your requirement. Are you looking for additional durability, then go with steel trays. If you're looking to save some money, you can choose plastic trays. When you buy Tribest Sedona dehydrators, you can rest assured that you will get the best quality whether you choose steel or plastic trays. Q: Can I leave the dehydrator running through the night? Yes, you absolutely can. The Tribest Sedona dehydrators come with a special night mode that reduces the speed of fans and takes less power than usual to dry foods. You will be able to get dry food by morning, but the dehydrator will not make any noise while it's operating at night. You can get your sleep without the irritating noise from the dehydrator. Q: I saw the specifications of some Tribest dehydrators and they come with two fans. How is this better than just one fan? The dual fan technology in certain Tribest dehydrator models comes in really handy when you're pressed for time for drying foods. With two fans, you can dry the food much faster and you can also program the dehydrator to use just one fan too if you're drying food in only half the trays. This degree of customization can really add to the experience of dehydrating foods. Q: How does the FAST mode work? What is the usefulness of this? The fast mode basically starts the dehydration process with a greater degree of efficiency than usual by heating the food up at a higher degree of temperature than usual. As the dehydration session progresses, the dehydrator normalizes the temperature. It is useful as it helps to bring out the moisture from inside the food and helps to dry the food completely. 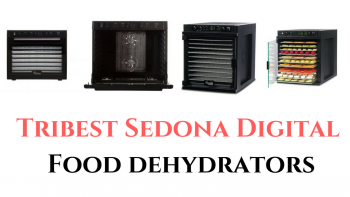 Tribest Sedona dehydrators are simply the best when it comes to quality performance and power-packed dehydration. The range of dehydrators is designed while keeping the end-user's' needs in mind. Innovative features like the transparent door with a light inside help to ensure the dehydration is going on as well as expected. The dehydrator trays are made up of stainless steel or BPA free plastic that adds another level of efficiency to drying all kinds of foods. The stainless steel trays are highly durable and you can clean them easily by hand or by putting them with other utensils in your dishwasher. Let's talk a bit about the warranties offered on the Tribest Sedona dehydrators. You can get anywhere from 5 to 10 years of warranty on these devices that makes them the best in their class in the industry. In the rare care that anything goes wrong with the device, you can rest assured that you will get coverage under the warranty. When it comes to using the devices, these are extremely easy to use. The large LED panels offer a quick and easy look at the temperature and the time remaining for the dehydration session to complete. You can use the night mode or fast mode dehydration from the panel itself. For high quality and advanced features in dehydrators, you can always trust Tribest Sedona dehydrators to deliver the same. For more information on dehydrators, please browse through our website. In case you have any questions or queries, please feel free to leave a comment and our team will answer you as soon as possible.